Transmission 2.4G WiFi: 4*4(support IEEE 802.11N, 800Mbps max). 5G WiFi: 4*4 (support IEEE 802.11AC, 1733Mbps max). Antena 4 external dual frequency omnidirectional PCB array antennas. Cooling Fin-type large-scale aluminum extrusion radiator. 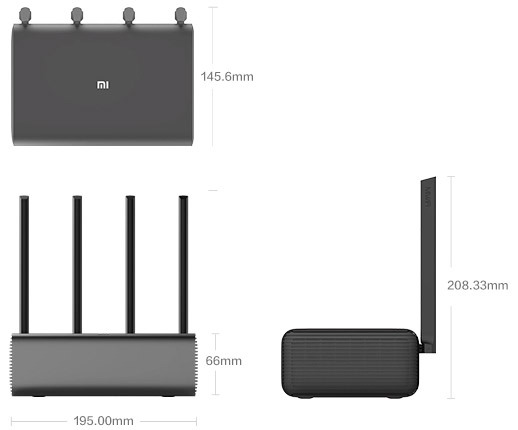 Support for 802.11ac, support for MU-MIMO technology. Synchronous dual frequency 2.4GHz and 5GHz. Modulation mode 11b: the DSSS: the DBPSK (1Mbps), the DQPSK (2Mbps), of CCK (5.5 / 11Mbps). 11a / G: the OFDM: the BPSK (. 6 / 9Mbps), the QPSK (12 is / 18Mbps), 16QAM (24 / 36Mbps), 64QAM (48 / 54Mbps). 11n: the MIMO-the OFDM: the BPSK, the QPSK, 16QAM, 64QAM rate set:. MCS0 ~ MCS31. 11ac: the MIMO-the OFDM: the BPSK, the QPSK, 16QAM, 64QAM, the 256QAM rate set:. MCS0 ~ MCS9 (supports 4 stream ). OS MiWiFi ROM (Supports Web, Android, iOS, Windows, OS X). Based on OpenWRT Deeply Customized Intelligent Router Operating System MiWiFi ROM. Advanced Administration For advanced users / developers to provide root privileges and native toolchain and SDK. Wireless security WPA-PSK / WPA2-PSK encryption, wireless access control (black and white list), SSID hidden. Features (SAMBA, DLNA, MiTV assistant), DDNS, port forwarding, timer switch, health mode, one key WiFi acceleration, fault diagnosis, microphone. (WiFi), mobile phone album backup, multimedia assistant. Open platform Support Thunder, Kingsoft Cloud, Sogou and other plug-ins, to provide third-party developer plug-in development tools. Applications Support for Web, Windows, Android, Mac OS, iOS. Approval standards GB9254-2008 YD / T993-1998 GB4943.1-2011.